Greetings from EdTechPosium at the Australian Catholic University's new teaching building in Canberra. Dr. Carol Russell from UWS is discussing "Online learning and the student perspective". Dr. Russell related her experience in the 1990s at the Open University UK (OUUK), with early online learning (later codified by Salmon). More recently, UWS has a new campus at Paramatta with no lecture theaters and Dr. Russell commented staff will therefore need to change their teaching technique. My worry is that with some incentive and training staff will not change their teach techniques: the poor quality lectures in rooms not designed for them. Dr. Russell showed a photo of a paper based examination at UWS. I was a little surprised with this, not that they were using paper for an examination, but that UWS was still having examinations at all. I stopped using lectures and examinations in 2008. Dr. Russell asked how to assess skills in the new university environment. The way I have been doing it since 2009 is to get the student to demonstrate the knowledge and skills they will need for a job, ideally in the workplace actually doing the job. This approach is also used with ANU computing interns and TechLauncher group projects. With these the students have a real boss (or "client") and a real task. This not just a matter of the student spending time on work experience, they are assessed against curriculum requirements. I borrowed these from the new ACU Library. This is just below the large flat floor classroom where EdTechPosium is being held. This was invaluable during my time studying for a MEd, due to its excellent collection of works on education (ACU generously provides staff of other universities with borrowing rights). These books are about a revolution in higher education which has been happening for decades and is still in progress. Many of the issues are still current and have been discussed at EdTechPosium 2018. One of the delegates, skeptical of futurism commented "The Future Will Happen". Greetings from EdTechPosium at the Australian Catholic University's new teaching building in Canberra. Michael de Raadt and Russell Waldron are discussing "Australian Curriculum for Digital Technologies, NAPLAN and the impact on higher education in future years". One point Michael de Raadt made that this is not just about teaching computer programming and there are physical tasks used, especially for younger children. As an example, some of the audience took part in a bubble sort: exchanging places until they were sorted by name. Russell Waldron pointed out that students have been through the Digital Technologies Curriculum from K-10 will already have some of the university graduate attributes before they start. However, students from other education systems may not. Russell Waldron also pointed out the Digital Technologies Curriculum students will have a different approach to assignments, including group work. These students will be familiar with using online document creation tools, including assigning attribution for group work. The students skills for working this way will likely exceed that of their university teachers. Michael de Raadt discussed problems and benefits with Online NAPLAN. This requires less manual handling of forms, but more dependence on IT staff, with the potential for technical failures. One benefit is that the feedback happens faster. Russell Waldron pointed out that the online tests require keyboard skills and are adaptive. These students will expect the same at university. A subtle aspect of this is that the assessment changes from how the student did on a standard test, to how the student has progressed. Greetings from EdTechPosium at the Australian Catholic University's new teaching building in Canberra. The keynote speaker is Julian Cox, Associate Professor, Food Microbiology, University of New South Wales on "Pedagogy, Peers, Professionalism, Platforms and Practice… and the Workshop Activity". He is describing evolving from online learning as an analogue of face to face lectures, with synchronous sessions, to something students can do in their own time (asynchronous). I agree with most of what Professor Cox was saying, but suggest online students need some synchronization, just not in the form EdTech people normally think of it. Ideally a self disciplined students can be left to complete tasks, including assessment tasks, to when it suits them. However, as a student myself, I found that if there was no deadline, and no marks, I would put off a task forever. One of my students has been working on a tool to break down the Synchronous/Asynchronous dichotomy. and hope to demonstrate this today at the conference. Professor Cox went on to detail the use of the Moodle Workshop Module to have students peer assess. This module is unused, perhaps because the name makes it sounds like something you would only use for a live face-to-face activities. Professor Cox then discussed how to guide students through preparing an e-portfolio (with Mahara). I fond it frustrating when I was told to "reflect" in an e-portfolio, as if this was an inherent skill. After six months hard work and guidance, I had a reasonable idea of what it was about. Then I had to tutor students who had been told to do this with no scaffolding. Griew, Borthwick, Barnes and Murali (2018), have proposed a new category of teaching university for Australia, along with invigoration of the VET sector. The most controversial aspect of this is removing the current cross subsidy of research from course fees. Course fees would be lower, with increased government research grants. Australian law currently requires universities to carry out research in at least three disciplines. The proposal is to have a new category of teaching university. There are already Australian institutions devoted to teaching, but these can't be called a "university", and so have difficulty marketing their programs. However, there are Australian universities which have been able to operate under the current rules, with a teaching focus. Two examples are Open Universities Australia (OUA) and Torrens University Australia (TUA). OUA is a consortium of universities offering online degrees. Students can choose courses from any institution, but then graduate from one. This provides the flexibility of an on-line program, but with the prestige of a bricks-and-motar one. TUA is registered as an Australian university, but with a relatively small staff. It is part of a international consortium of mostly teaching universities. What Griew, Borthwick, Barnes and Murali (2018) don't address is the role of research as a university marketing tool, particularly for attracting international students. Students, and their parents, look at university ranking when selecting an institution. This is despite these rankings having little to do with teaching quality, being largely based on research reputation. A teaching only institution will not rate well for research, and so not attract students. Will Teaching Only Universities Lower Costs? The claim that separating research and teaching would lower costs would need to be tested, along with the claim that the savings would go to research. The UK has had the experience where government freed up fee setting expecting completion leading to lower fees, but universities charged as much as they were allowed to. Also if government take funding from fee subsidies, there is no guarantee this will be invested in research. The proposals for the VET sector are less contentious. Successive Australian state and federal governments have implemented poor policy, badly implemented, which has adversely effected VET and TAFE institutions. An approach which encourages students to study in the VET sector, before, alongside and after university should be introduced. Robert Griew, Jessie Borthwick, Cameron Barnes & Arun Murali (October 2018). " "Social equity in the energy transformation". ANU researchers project that the crossover to more renewable than fossil fuel electricity generation will happen in Australia by 2025. The question now is not if this will happen, but how to handle the social and economic effects of this. Without action this may make social inequities much worse in Australia. ps: I am taking part as a member of the ANU Energy Change Institute and as I teach ICT Sustainability. Neil Selwyn has suggested that "Even the smallest schools are stuffed full of digital devices, display screens and projectors" and this is not sustainable. He suggests we need to rethink the use of educational technology (EdTech). However, I suggest we need to use less EdTech, but more intensively, both to reduce its environmental footprint and get maximum benefit from the investment. In 2008 I was commissioned by the Australian Computer Society to design a course in ICT Sustainability. This was first run in 2009, and has been offered since then by universities in Australia and North America. Students learn how to estimate carbon emissions and e-waste from ICT, then how to reduce them. One of the key points to reducing the environmental impact of ICT is: when you have it, to use it intensively. As Professor Selwyn points out, much of the environmental impact of ICT come from the manufacture, so using less equipment more intensively reduces e-waste. Also, ICT equipment tends to use almost as much energy when switched on and idle, as it does being used at full capacity. So it is better to buy less equipment and then use it intensively, than have equipment switched on but doing nothing useful. The situation may well be getting worse, rather than better. 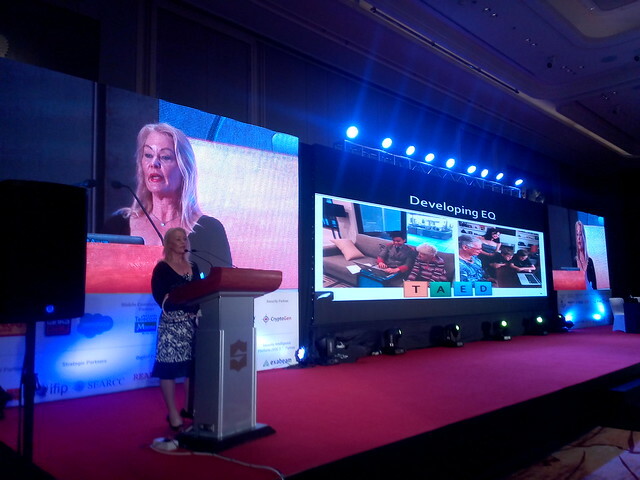 A few weeks ago I gave a presentation at EdTech Asia 2018, on Energy Use With Flexible Classrooms. Universities are moving from large lecture theaters where students sit and listen, to flat floor flexible classrooms with screens on the walls and devices on desks. If not carefully planned, this could greatly increase the energy consumption of the campus. The worst situation would be if the university retains its lecture theaters, and adds flat floor classrooms as well, all with equipment running in both. It can help to have classrooms which can be switched off when not in use. But it is better, as with ICT equipment, to not have more classrooms than you need, and use them intensively. One way to do this is to have flexible rooms, which can be reconfigured, with movable furniture, seating and walls. As part of EduTech Asia 2018 I went on a bus tour of Singapore universities. At one stop the staff proudly showed off their large auditorium. However, this space had fixed tiered seating, and fixed walls. As a result it would likely stand empty most of the year. In contrast, ANU is finishing a new ANU Culture and Events Building with rooms of retractable tiered seating. When not needed for large lectures, the seats can be retraced, leaving a large flat floor space. At another university on the EduTech tour there was a "Moot Court" for training lawyers. This was an impressive wood paneled reproduction of a courtroom. However, here again, the seating was fixed, making the room less usable most of the time. Instead I suggest having movable furniture which can be configured as a court when needed, and rearranged for other forms of learning. There is not an inevitable trend to more energy intensive EdTech. At EduTech Asia 2018, Crestron's AirBoard was demonstrated. This is a camera which clips onto an ordinary whiteboard, in place of a smart-board. As well as being cheaper, this should be more energy efficient, and result in less e-waste. In A Higher Ideal for Higher Education, Dr Patrick Blessinger, of St. John's University, argues for humanism, in an expanded system. However, I suggest this will not be enough to produce the globalized and democratized world Dr Blessinger envisages. As an example we have seen the world's most eminent scientists warn of an approaching climate disaster, backed up with overwhelming evidence, but ignored by the world's governments. Idealism is not enough, we need teachers trained in cost effective course design, in expanding higher education. Dr Blessinger argues for the "... integration of teaching, learning and research ...". However, integration requires more than professors who leave their lab occasionally to do some part time teaching. Achieving this integration requires academics who teach to be formally trained, tested and qualified in education. This also requires specialists in packaging education to make it cost effective. Expanding higher education requires changes to address the vocational needs of the population. Education needs to be more accessible, and cost effective. This can be done through proven vocational and distance education techniques. Unfortunately, many academics have been reluctant to embrace these approaches, despite the evidence this is effective. 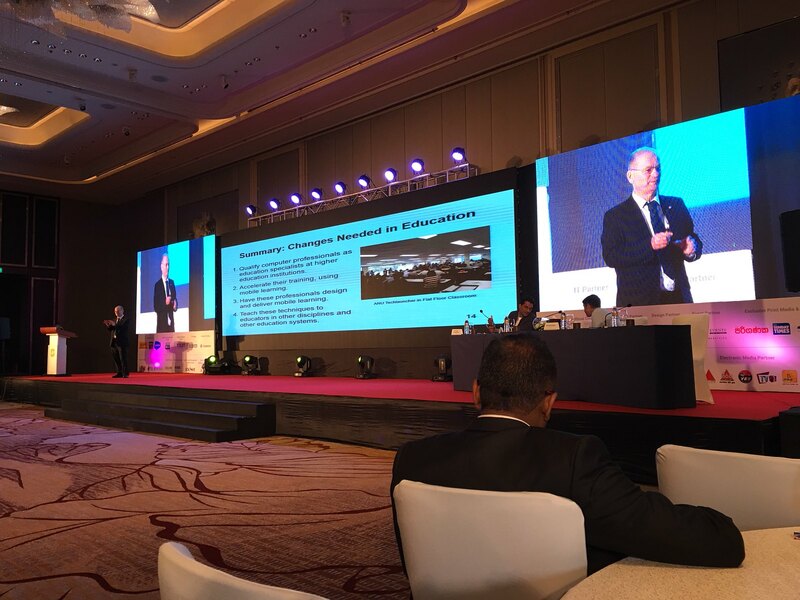 Recently I returned from two weeks in Sri Lanka and Singapore, speaking on education at conferences and visiting universities. I saw many impressive campuses and dedicated staff. However, these campuses cannot meet the demand for higher education in the region. Even if enough campuses could be built, teachers could not be found to staff them. Even if the staff could be found, the students, their families, the community and governments could not afford to fund this expansion of education. We require different approaches to the traditional campus education. These approaches exist and are proven from decades of experience, backed up by research, but academics are still reluctant to embrace new ways of teaching and learning. Students learn best when they work on a practical problem, in a team, and ideally, in the workplace. Academics acknowledge this approach when it comes to higher degree research students: get them in the lab, or out in the field, working on their project. However, academics are reluctant to embrace this approach for undergraduate and postgraduate non-research-track students. The temptation is to have students in a lecture theater and doing examinations: these are just about the worst ways to teach and test, but are easy, cheap, and familar. Part of the problem is the sheer complexity and cost of having thousands of students at a university in teams working on projects. But we have the pedagogy and technology to do this now. Academics need to learn how to do this, and I suggest the best way to learn is to do it. We need to have academics as students using the teaching techniques we want them to use. My discipline of computing has the fortunate problem of too many students and not enough instructors. I suggest we make a virtue of necessity and train professionals from the discipline to teach. We can use mobile learning to provide computer professionals with micro-credentials in teaching. The Australian National University is offering a free online short course "Seven Key Concepts for University Teaching and Learning", 14 to 20 November 2018. This is part of the ANU Coffee Course series, where the student spends only about as much time it takes to have a coffee break studying each day. You read a brief summary, watch a video, answer some questions and discuss in an online forum. ANU staff can obtain formal professional development recognition, but teaching staff at any institution are welcome to take part. This will be the sixteenth coffee course I have been a student in. "Have you ever wondered about concepts like 'constructivist learning' and what this approach means in practice? How relevant are these ideas to everyday teaching at university? This fully online, self-paced coffee course will provide an opportunity to unpack this and related concepts in five quick snapshots over your daily coffee breaks! Day 1 – Why learning theory? How will this help my daily work as a university teacher? Day 2 – Surface versus Deep Learning. How deep do your students dive? Day 3 – Taxonomies of learning and knowledge – are they useful? Day 4 – Adult learning theory. Do adults learn differently? Day 5 – Constructivism and some other ‘isms.’ What do they mean? " Back from a tour of high-tech university campuses in Singapore (at EduTech Asia 2018), I was reading an sales promotion from one vendor on the benefits of a smart campus. 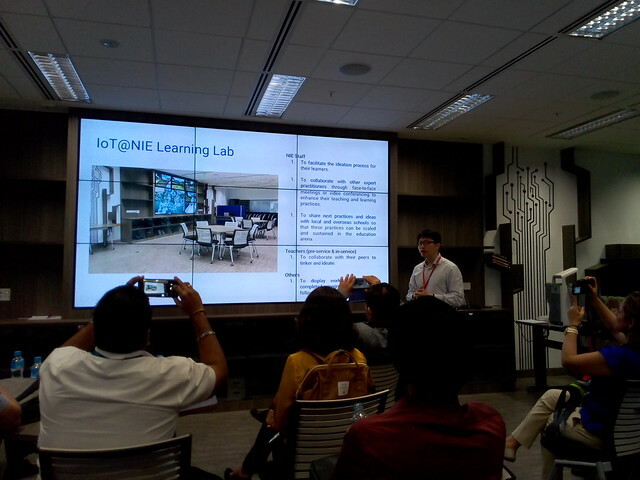 However, the smartest classroom I saw in Singapore was the IoT@NIE Learning Lab at Nanyang Technological University was smart without having the tech overwhelm the learning. The IoT@NIE lab has tables on wheels and screens on the walls. The screens can be plugged into laptop computers on flip up shelves, built into the walls. The beauty of this arrangement is that while the room is intended for teach IoT, there is not too much fixed tech in the room, getting in the way of the learning. Previously desktop computers were provided for students at university. This meant having mains power and data cabling to each desk, requiring the furniture to be fixed in place. 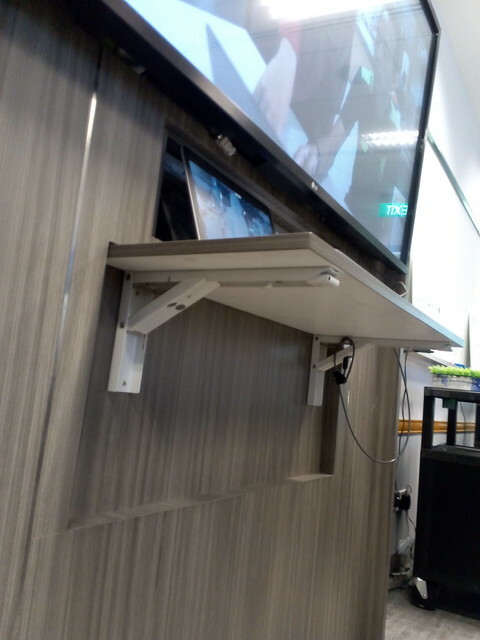 But now students can BYOD (Bring Your Own Device) and connect to the campus WiFi, eliminating the cabling to desks. The furniture can be freely moved around and pushed aside. The only fixed devices are attached to the walls and on the instructor's console. Perhaps we have reached the point where there could be BYOE (Bring Your Own Ethernet). Students would use the wireless Internet on their mobile devices, instead of a campus network. WiFi might still be provided in classrooms, where the network is needed to support the room equipment, or staff might use their own BYOE. Greetings from the Research School of Computer Science at the Australian National University, where Peter Baranyi, of Szechenyi Istvan University, is speaking on Cognitive infocommunications (CogInfoCom). He started by comparing a DOS character based computer interface with a Microsoft Windows interface. At the time the desktop metaphor was popularized by Microsoft many said that this interface was either trivial like a computer game, or much too complex to be usable. However, it turned out to be wildly popular. Professor Baranyi argues the GUI works well because the visual centers of the brain came can process it. He compared this to the whiteboard wall in the computer science building, which can be written on, from wall to wall, uninterrupted. He then showed several command center designs with multiple screens for each operator and wall-to-wall display screens. Professor Baranyithen pointed out that we don't all have the luxury of the space for displays there are in a purpose designed command center. Instead this can be emulated in virtual reality. The VR space can be populated with with windows showing separate projects. This can be enhanced using a 3D effect. However, I have some doubts about the value of emulating a real space in VR. If emulating a real world situation, this may make sense, but for more abstract representation may be better. As an example, Professor Baranyi showed an animation of a chemical plant. However, the operators of such a plant use a simplified schematic diagram. Another example is the London Underground map, which doesn't accurately reflect the location of stations, but is easier to use. Professor Baranyi showed the results of an experiment (Lampert and others, 2018), where subjects were given a series of documents to ope. The documents were first provided as attachments to an email, then as hypertext links, then using the Moodle Learning management System and lastly using a 3D interface. The result was that the 3D interface was much faster. He argued that this was because the 3D interface supplied the documents in the order required and were grouped. I did not find this experiment very convincing. In designing e-learning using Moodle I provide a documents as hypertext links in the text, then three or four grouped as a reading list in the order I want them to read them. In addition I provide a bibliography in alphabetical order. Like many new university lecturers I started by providing dozens of documents for students to read. In part through experience of teaching, but more so as a student of education, I learned that providing dozens of readings just confuses students. Now I provide three or four, in the order I want them read. Also I "chunk" what I want students to do, so they are not exposed to too many steps at once. Currently I have a student working on a way to insert quizzes and discussions into a video. The idea is that the video will stop, the student do a quiz and the video restarts. This doesn't need a 3D interface and such an interface would be difficult to use if, for example, the student is sitting on a bus. The us of 3D interfaces may well suit very complex tasks. But such interfaces do not suit users under stress, be they airline pilots or students. Pilots are given simple checklists and are trained to do each step in the same order every time. The checklists my be chunked, so that they do not have to go back to the start when they miss a step. Similarly a student under stress, wanting to know what to do for an assignment needs a series of simple steps. There was a fashion for the use of Second Life for education some years ago. However, there are now many abandoned college campuses in Second Life (Patrick Hogan', 13 August 2015). The problem was, I suggest, these were too accurate reproductions of the real campus. This is not to say a 3D interface cannot be useful, but it needs to be a bit more creative than just a rendering of the real world. 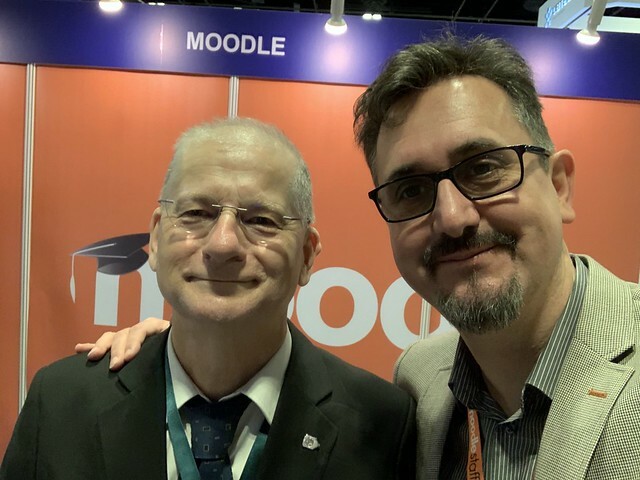 It was a delight to bump into Martin Dougiamas, founder and CEO of Moodle Pty Ltd, at EduTech Asia 2018 in Singapore this week. Martin gave a presentation "Moodle the world’s most widely used LMS". This is also a product I have used day in and day out since 2009, as a graduate course designer, on-line instructor at two tertiary institutions and as student at four. I will be demonstrating some of my use of Moodle at Edtechposium, 29 October, and Telfest, 5 November, in Canberra. As a child I enjoyed watching black and white science fiction disaster films. Scientists in white coats would warn of impending doom, but be ignored until it was almost too late. I don't have a white coat, but I am a member of the Australian National University Climate Change and Energy Change institutes. Some of my colleagues helped write the "Special Report on Global Warming of 1.5°C" for the Intergovernmental Panel on Climate Change (IPCC), issued 8 October. The report warns of more extreme weather and rising sea levels if carbon emissions are not reduced. The report says limiting global warming to 1.5°C requires "rapid and far-reaching" transitions in land, energy, industry, buildings, transport, and cities." Unfortunately, like those old science fiction films, such unwelcome news is not well received. But some changes can be made which enhance human well being while also reducing emissions. 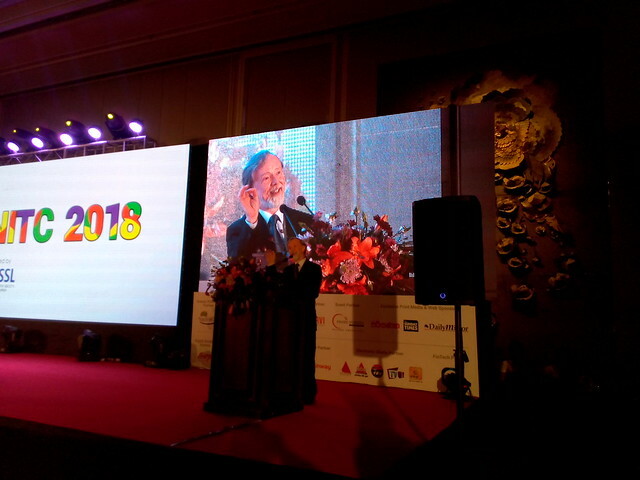 At the EduBuild Asia 2018 conference in Singapore today I am suggesting the increased use of blended, online and mobile learning. Older students can spend more time learning via their mobile devices, away from campus. Classrooms can be reconfigured and teaching techniques changed, so when on campus students learn much more intensively. As well as improving student's education, this will reduce the carbon footprint of the campus. Greetings from the fist day of the Computer Society of Sri Lanka (CSSL) National IT Conference (NITC 2018) in Colombo. Carey Furze founder of Bookform, is speaking on emotional intelligence. Greetings from the fist day of the Computer Society of Sri Lanka (CSSL) National IT Conference (NITC 2018) in Colombo. Last night it was announced that CSSL has become a provisional member of the Seoul Accord. Professor Michael Johnson of the Australasian Computer Society explained the way the Accord provides mutual recognition of professional qualifications in the global IT industry. On the second day of the conference I am speaking on how mobile devices, micro-credentials and blockchain could be used to make qualifications more flexible.